Having a mother is considered one of God's greatest blessings. For those of us fortunate enough to have a mother living and guiding us, it is nothing less than a gift from above. A good mother happens to be the best friend, philosopher and guide for her child. She is the one to turn to for some much needed advice whenever we are in a fix. 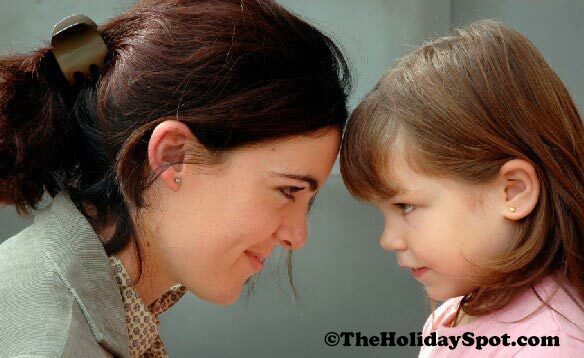 TheHolidaySpot has compiled here some of the most common advices rendered to their children by doting mothers, irrespective of nationality or religion. Readers are welcome to contribute and share the best and greatest advice they ever had from their mom. Indulge in a memorable Mother's Day celebration! One particular habit, common to all mothers of the world, is providing advice to children, whether they want it or not. Always anxious for the best of their children, mothers never seem to tire of giving advices to their kids. Surely you must have also felt something like this and have even snapped at your mum now and then to put an end to her verbal discourses. We all do. But remember how often have you found her advices useful for you and saving you from a lot of troubles? With years of experience behind, practicality becomes a hallmark of most of our mothers' utterances (something we all must admit). It is her wisdom that brings us up through our early years. For many people, their mothers' advices are lessons that remain forever with them and guide them at all junctures of life. What was the best advice mom ever gave you? Send it in to us and we will publish it right here after a review. How many times do I have to remind you to put on your woolen clothes and jacket? You will be down with fever before long. C'mon now, clean up the mess and tidy up your room. Looks like you are going to turn it into a stable. Don't make that face or I'll see that it remains that way for ever. Don't put that thing in your mouth; you don't know where it's been! Look to the left and look to the right. Cross the road only when you find both sides clear. 7. Make sure to change your underwear always; you never know when you'll have an accident. What if everyone jumped into a well? Would you do it, too?